← Watch this space… David Archuleta gets the hero’s welcome he deserves! Source: raelovesarchie on Tumblr (via Something ‘Bout Archie! ), find more HERE. 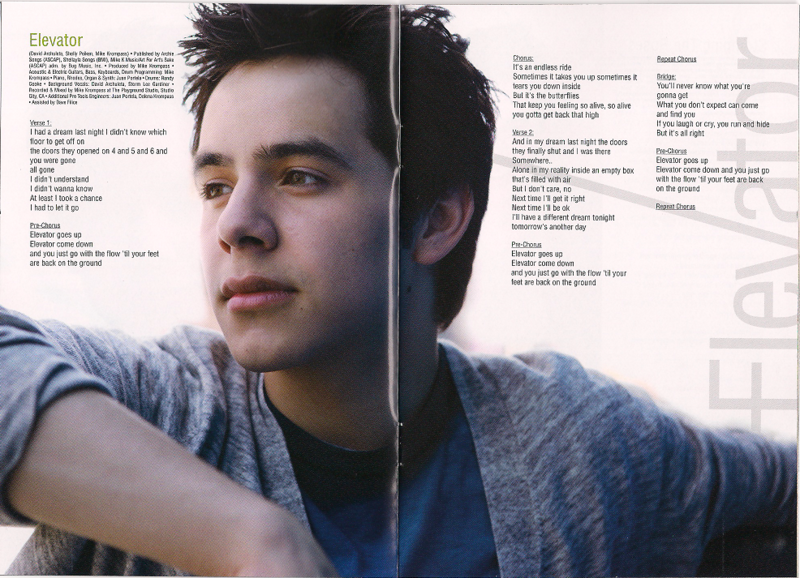 Almost as much as the new songs in David Archuleta’s TOSOD Asia Tour Edition CD, I am blown away by this lyric book! I don’t know about you, but I would have loved to have had this instead of the original Fan Pack (let’s blame Jive, shall we? 🙂 ). One thing I miss about LPs is the lyric books or printed sleeves that came with most of them. Used to love poring over the lyrics of every song and studying them like poems. This entry was posted in Fan experience and tagged David Archuleta, love don't hate baby, The Other Side of Down Asia Tour Edition. Bookmark the permalink. Just realized I posted in the last thread (which was wonderful) by mistake so I’ll post again. David and the band must be wowed in Asia, concerts will be fabulous and yes, I hope David does sing his new songs over there, I'm sure he will. Lots to come! I am now loving all of David's new songs and I agree, LDH would be so good live. 'Wait' still has to be one of my faves. His tone, his emotion, the whole feeling of the song just puts me in a very sweet space. Right now it's the one I listen to most. Tomorrow it may be one of the others. Videos of these new songs would be incredibly wonderful. So much love in the 'Asian air' and it's spreading across the globe! Very happy for David and his devoted fans. Oh and I used to love the lyric sheets in albums too, always read every word. Love the lyric book….. and Wait is on repeat so far, but I truly like them all, and will move on soon…. For some reason E and M is really growing on me……He does these kind of songs so well….. the achy voice = love! I asked him..”Can I sing for you?” and he went uhmm yea sure go ahead. My heart was pounding and I started to sing but I burst into tears..
Just had a reeeaaaaallly interesting chat with Jeff. He’s in good hands. David told me I’m a very good singer and songwriter. I couldn’t ask for more, could I? I couldn’t finish the whole song cause I was badly crying and I said sorry I look horrible but he was being so sweet and gentle. Gosh. I said that I wrote this song for him and he gave that awwh face and I apologized again in the middle of it and said that he’s my hero..
..and he was just. Ah I don’t know, he said something like thanks. Then when I was finished the person from ponds told him that I did a rap. PS: he wore flashy black shoes. If you like Everything&More, it sounds soooooooooooooooooooo much better live. David didn’t really like NAVGL cause it’s a song for teen audience than general that’s why they put in P&A. It’s probably 19 songs + an encore. OH! I forgot! I told David that I did a livestream and told him who were watching and he was really happy. Ah! I’m sorry Beliebers but David Archuleta owns Indonesia. David did a short soundcheck. I saw tweets saying he sang ALTNOY and STR. TVOne is going to give a little David segment. ..and wrote seven songs. And there you go, ALTNOY and SOT were born. Does anyone know what is the +7 means? BUT DON”T LOOK DOWN, ‘CAUSE THIS IS REEEAAAAL. I cannot with this song. Thanks for giving us a reason to talk about these songs. It’s all I want to do. Because. That and Notice me will not leave my head. You know how pieces of songs stay in your head and won’t leave? Yeah.That. I may have been at work. Another Journey song on the piped in music system. Trying to count thousands of $ and balance the day. But David’s voice was in my head and his voice on EAM is so beautiful that I cannot think of money. So it gets recounted. I am sorry for this crazy post but it is David’s fault entirely. And sometimes I feel like I am the only one liking this song. It’s gorgeous. And it hit me unexpectedly. More on the other songs later. Except this. I hear The Beach Boys influence on Wait. betsy, I’ve seen lots of love for EAM… and this new version sounds so much better than what we originally heard on that Singapore radio station. Of all the new songs, it’s actually the only one I “feel” and get emotional about when I’m listening to it. And I love the “like a satellite we’re flying” part… LOvE that, really lifts you up. Had to choose “All of the above”…just keep listening over and over again. Can’t wait until tomorrow! jh52, welcome! & me too, I keep listening to them all! I sure hope someone got this on video! Oh my heck. I am very excited to hear this live. I love all the other songs too but I can’t tell if I am just loving them because they’re new or how they would compare with the other songs if they were all released at the same time. But I can tell you LDH has a fighting chance with some of the TOSOD songs lol. refnaf – LOVE that fields of gold video. AMAZING audio. Thanks for bringing it over! Yeah, hive-five abanana, from another LDH fan! I love it more with each listen. I just like the way it sounds..from the production, (yes), to the lack of production, the message, the guitar, the melody, the whole vibe. listened”….my husband will be a happy camper that I am listening to this everyday. I want to seeeee and hear this! so anxious to see how it plays live! Oh, also. The picture beside the LDH lyrics. *is really dead* ‘nough said. OK so I have managed to extremely confused myself but I’m pretty sure 9pm will be 10am in EST (not 8am). You all should trust me because I am a mathematician. 😛 Hahaha I really could be wrong someone should double check. Lol tofan, and you could moonlight as a standup comedian! He was tip-toeing through the tulips pretty good there, lol! Had to laugh at the “uh-oh” from the girls who posted the interview when she asked if he would sign her t-shirt, lol! OMG, that interview with the bold flirty host is so funny. Put a smile on my face. David is the sweetest, always handles himself like a pro and like a gentlemen. Love how he signed her Tshirt and his expression when she asked him! Way to go David. I have a feeling he may get that kind of thing a lot from young hosts on this tour! Probably not the type he would ask out, ha. Is it just me or is David looking like a handsome 19 or 20 yr old these days? Looks his age to me, think I just realized he’s all grown up, aww. I will try and be alert at 7 am tomorrow for the fabulous livestream but may miss it live. What amazing fans David has and 19 songs ? Whoa. Thanks for all the wonderful info. She says she is going to live stream but not sure if audio will be good. Wonder how long her battery will last….hmmmm….anything is good. Cool pics TOfan. Waiting in the rain. Yikes. Guess fans have a postal philosophy…‘neither snow, nor rain, nor heat, nor gloom of night, nor the winds of change, nor a nation challenged, will stay us from’ an Archuleta concert…. New definition of ‘going postal,” lol. I’m looking for predictions of attendance or how many can get in. Anyone know? plus my stream went funky & totally missed WFM & most of EAM, rest was amazing clear though, did not expect that! Fireworks?????? how perfect is that??? I missed TOSOD too, lol, but saw peeps there tweeting about it … wow, he was going all out, hope he gets vocal rest tomorrow! Loving the last pic, great shot! Missed TOSOD, ZG, MH, most of Elevator. Loved LDH and EAM, FS was amazing. EWTRTW, totally lost it with his dedication of the first line to the fans. GGTT ending sounded epic, can’t wait for that one. Changes in Blackbird, anxious for that one too. Like ATM but miss Angels. How does he sing that high, sing with such passion and every ounce of his being, sing that many songs with barely a breather…with a voice from the heavens from the first note to the very last. YES! Excited for GGTT ending (hoping for a video) it sounded EPIC on the Ustream! Probably the biggest “wow” moment of the concert for me. So I had to step away early in the Ustream which was kinda spotty for audio. Listening to the recorded one from scpancake and the audio is so clear. WOW! SBL is a fav!! I can’t quit watching this and I need to get junk done before the videos start rolling in! abanana, the end of the GGTT starts around the 34:45 mark… those noooo’s and yeaaahs, OMG! I would have been screaming my fool head off. Listening to My Hands now….love that song….oh, the a capella ending always gets me to tears…he rolled those notes out like silk velvet….gulp….wish I had been in THAT crowd. So who’s looking at air schedules and counting their savings to see if they can make it to Vietnam or Malaysia concerts?!!! LOL The Asia fans are showing us how it’s DONE!! Love them, love this concert. Really enjoying the band and the music….now that is the way to showcase David’s voice, it flows around it, supports it, buoys it. You are so right Kizzi, he’s gonna hate to leave. kizzi, great description of the band. I love acoustic David but this band is worth every penny he is paying them! @91_TTY It feels like doajknhdlkaljdkalah OMG i just met David archuleta and listened him singing LIVELY in front of me! Never forget this moment! Clouds going by in background video…like it much. I LOLd so hard at this interview (the one for Dahsyat)! It seems the girl really liked David! I mean, she yelled at him, flirt and kept interrupting him all the time! Anyways, I think it’s worth watching so I’ll leave here the link of the post I did about the interview (where I also put the vid)… Enjoy! A thousand words in one snapshot! I am in a STUPOR over the amazingness of LDH!!!!! Been waiting for your comment on LDH tofan, it has quickly become my favorite! That pic of him in the “blangkon” is one of the most adorable pics ever of him. Hope we get a front view of it from someone. Epic concert! Wow….the love, the Superstar performer, Jakarta will never be the same. Vids already too, whoa. LDH and EAM, fantastic. All fantastic, David couldn’t have poured out another ounce from his wonderful self and the crowd, so much love! Can’t tell you how many times I got emotional watching it all and his little talk before EWTRTW did it too as did EAM, as did the fans responses to having their dream come true. David touching hands from the edge of the stage this time had me hoping he didn’t get pulled in and loved and kissed to death, haha. A phenomenal artist and person like David can only attract phenomenal fans and they are. Didn’t see TOSOD either but everything else. Well, first stop on this love fest for David. He and the band must be loving every moment and having the most memorable time. Hope to see a vid for GGTT too and everything else! Tip: Full screen this, my friends!!! The freedom, the dancing! You can tell he feels the love and it gives him wings to fly! Wooooot! ALTNOY … oh em gee, the singing along!!! Heavens to Murgatroyd…talk about the quintessential balance of the song controlling the singer and the singer controlling the song…he gets lost in the song but is in command at the same time…does that make sense?!! As many times as I’ve listened to this on CD, video, live and even video’ed it myself more times than I care to reveal (lol), it still amazes me! And that ending, one of his best…yeah, we should go all out for what we are passionate about and David walked his talk and showed his passion last night, FULL THROTTLE. I, ever the analyzer, have to say the Ustream highlighted it and these individual videos bring home that David is at a new performance level. His body language is more and more open, his comfort with his arms and hands expressing his music supporting his voice is ever expanding. His voice is deeper and hits those silky, velvety tones time and time again. Gorgeous. Hallelujah, and keep that fire going!! Stomping the Roses & Other Side of Down … ohmyheck the screams when D. comes on stage!!! He kills me here. Hoping we get another video with better audio. Can we keep the wind machine? Love the wind machine! There are some great photos out there with David’s shirt blowing in the wind, belting out a song…a little MJish looking, very nice. Wow, just catching up on some videos at the end of the day. Fantastic, love David strutting the stage, little dance moves, taking command of it all and just pouring his all into song. What a concert and this is only the first. Love those sweet fans, some of them stood in rain and mud for hours and some cried their hearts out that they didn’t get to meet David but all showed their love and support and took home an incredible memory and experience they will never forget. Gotta love the fans singing every word along with David, haha. He had to love that. David Archuleta talks about his new journey as an independent singer-songwriter as he gears up for his upcoming concert in Kuala Lumpur. David Archuleta has the buoyant wholesomeness of a Disney Channel pin-up. Blessed with boyish good looks and soothing, vanilla vocals, the childlike singer with the cute charisma has come a long way since he first stole our hearts on the seventh season of American Idol. After a brief episode with a paralysed vocal chord that nearly destroyed his singing dream at age 13, young Archuleta emerged the runner-up on the hit reality series just five years later. Now at 21, after a highly successful self-titled debut album, which sold nearly a million copies worldwide, his season CD Christmas From The Heart (2009) and last year’s The Other Side Of Down, Archuleta is ready to go his own way. Free as a bird: Now at 21, David Archuleta is ready to go his own way with his music career. It’s a certain change of environment, but if the wide-eyed singer has anything to say about it, it’s a positive one. “A lot of people were surprised to hear that I’m not with Jive Records (owned by Sony Music Entertainment) anymore. But it wasn’t like that. I’ve actually been offered a different deal to still stay signed with Sony but I just felt like I haven’t been happy for the past one or two years and I haven’t been going the direction I’ve been wanting to go,” said Archuleta in a recent phone interview from Nashville, Tennessee. “Ever since Idol, it was like go-go-go-go-go; do this, do that! There were so many people telling me what I should be doing and what’s going to make me successful but I didn’t actually have the time to think about what I really wanted to do,” he added. Just like his affable persona, the singer was chirpy and candid throughout this interview. 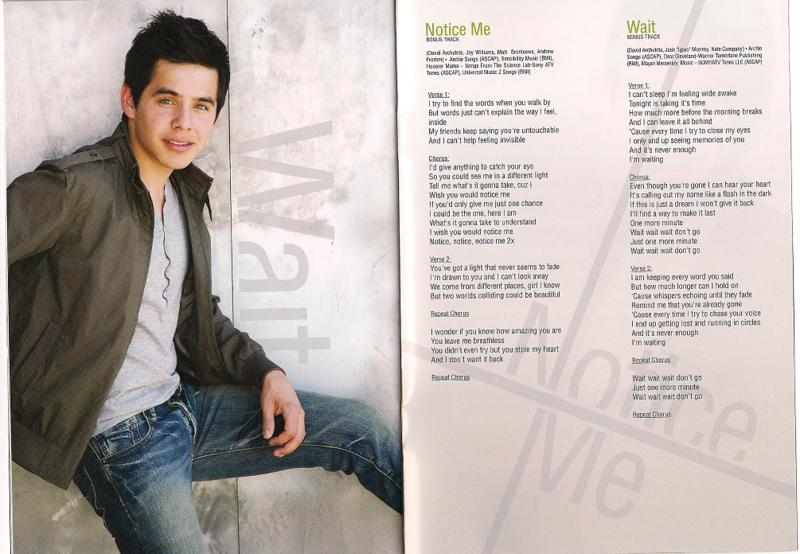 While his heart is still set on singing, Archuleta said he is not looking to be signed under a new label at the moment. For now, he is working towards writing his own music with songwriters from the musical city of Nashville. While country music remains synonymous with the city, Archuleta said the local music scene has a healthy variety of pop, punk and rock. But despite his inherent optimism, the singer isn’t afraid to admit that his transition from manufactured pop star to independent songwriter has not been all smooth sailing. “I was always so afraid to do this before, making decisions for myself because there was always someone else making decisions for me,” he shared. Archuleta, who began performing publicly at 10 when he participated in the Utah Talent Competition (and won the children’s division), also revealed it is hard for him to finish a song on his own. 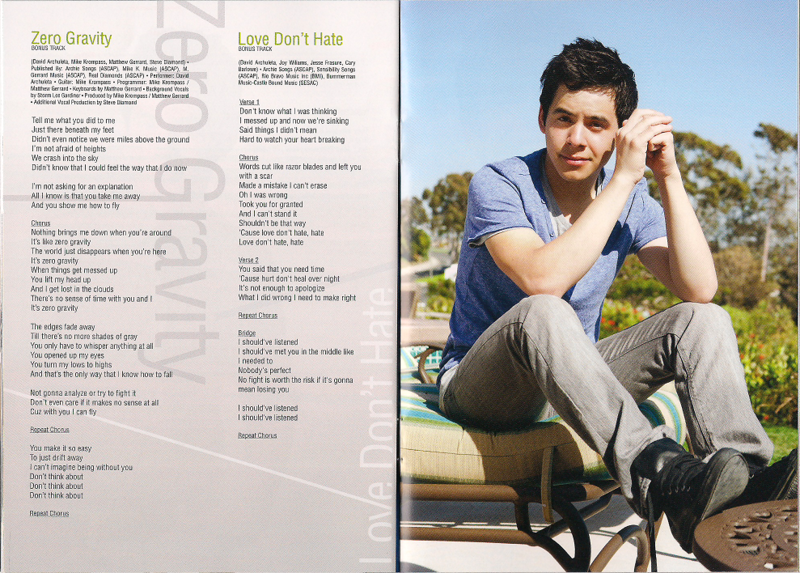 Pop fans can breathe easy, though, for Archuleta will not abandon his pop roots just yet. The best part about making music on his own is that he doesn’t have to meet anybody’s expectations anymore, he said. Faith also takes precedence for the singer. His family background is also a strong one. Besides writing songs, he is also working on shows for the Christmas holiday season. “There could even be a Christmas release, even if it’s just a little one,” he hinted. But his Malaysian fans won’t have to wait that long, for the congenial singer will be back to perform his first full concert here on July 26 at Stadium Negara in Kuala Lumpur. Archuleta, who was last here in April 2009 for a mini showcase in Sunway Lagoon in Selangor said he is very excited about his upcoming concert. Fans of Archuleta can expect a performance filled with breezy, light-hearted numbers from all his albums at the concert. Yes my friends, it most definitely is….. ChRiStMaS in JuLy!!! Opening of concert: The excitement! Too cute to miss! Just have to say seeing the Jakarta audience fuel David and vice versa was electrifying….the energy pulsing back and forth was palpable and arresting. Simply WOW. TOfan – love the Jakarta concert fireworks as your wallpaper! Thanks kizzi for the video spamaroo! I am in up to my elbows. My Hands, my heck! And the ending of Crush with the touching of hands, the blankgon. I don’t know how I am ever gonna crawl out of this Asian tour. “I, ever the analyzer, have to say the Ustream highlighted it and these individual videos bring home that David is at a new performance level. His body language is more and more open, his comfort with his arms and hands expressing his music supporting his voice is ever expanding. His voice is deeper and hits those silky, velvety tones time and time again. Gorgeous. Hallelujah, and keep that fire going!!”….. amen, amen, amen. As tofan eluded to, spread those wings David. You are so right Emmegirl. Holy….Guacamole, Toledo, Batman or any other expression that attempts to express this preternatural joy-a-liciousness!!!!! of his insights. I like this phase of Archie fandom – sit back, relax, enjoy. It’s happening right before my eyes. Kizzi, do you have a link to the interview? thx! Prob a little too late. New post/thread with article Kizzi posted & whole Indonesia set list on video!